Web Development is an ever-changing field — the way we build websites today is completely different from how we used to do it a couple of years ago. With the plethora of tools available and the new ones popping up every day, most of the time developers find themselves confused about which way to go. I am the author and maintainer of “Developer Roadmap” which lists down the roadmap, the tools and technologies that you would want to learn to get into the frontend, backend or the operations. I initially created these roadmaps in 2017, then updated in 2018 and most recently revised in 2019. 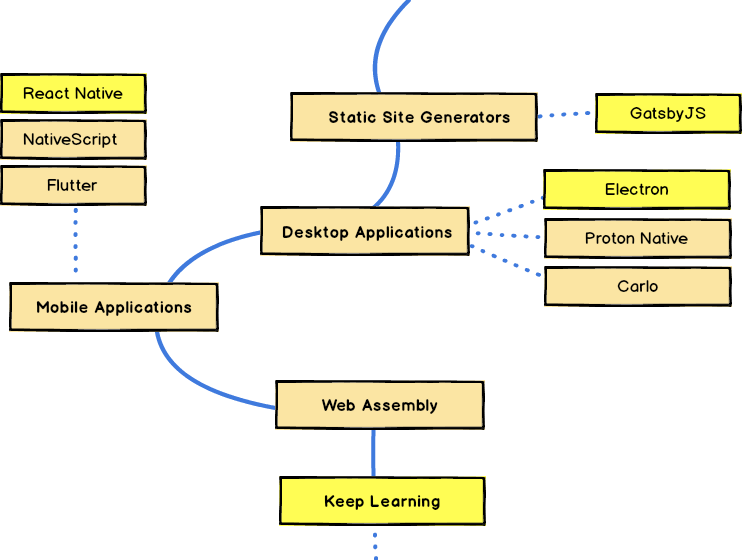 At the time of this writing, frontend developer roadmap has been updated for the current year. I am still working upon the Backend and Operations/DevOps roadmaps and will hopefully release it in the next few days. 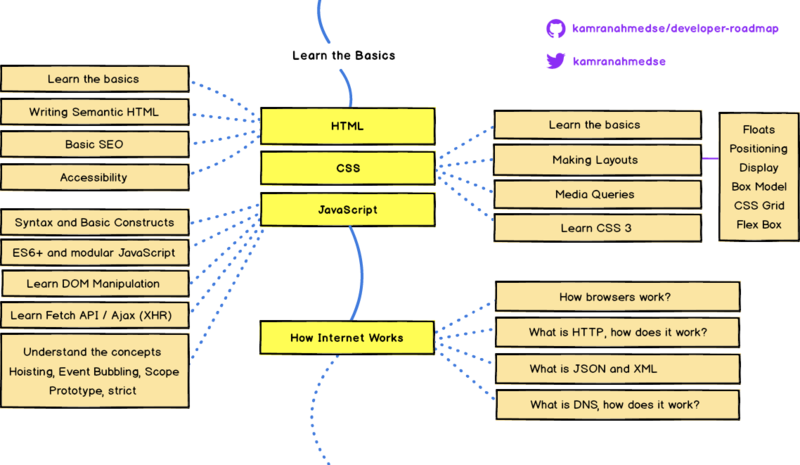 In this post, I am going to recap a bit and share with you the motivation behind making these roadmaps, a few disclaimers if you decide to follow these roadmaps and finally have a breakdown and tips on how to learn if you were to become a modern frontend developer in 2019. Before we get started with the article, just to give you an idea about me, I have been doing the Fullstack Development for the past 6 years and currently working as a lead engineer at tajawal where I have to wear many different hats as a part of job. It is not only my hobby but also one of my job responsibilities to keep an eye on the trends, taking up the tech decisions and keeping the developers motivated and trained. Web Development has evolved a lot and has evolved fast; the number of options available on the frontend are enough to baffle anyone. I am pretty active in the opensource and the community; if I had a penny for every time I was asked or saw this question “what should I learn next” pop up in the forums, I would have retired a couple of years ago. Circa 2017, an old university professor of mine was preparing a set of paths for her students to give them an idea about the market and reached out to me to give her a list of tools and tech recommendations for web development. I jotted down a rough sketch and forwarded to her but later on I decided to clean it up a little and put it on GitHub so that I could refer anyone to that whenever I am asked this question. And that is how these roadmaps were born. Do not ignore the fact that languages and tools can be very market dependent so do some research on the market that you are targeting. You don’t need to learn all of the things listed here to land your first job. The roadmaps might seem humongous but don’t let them scare you if you are just stepping into the web development. I have just tried to cover everything that you will eventually be learning or using. You can learn the bare minimum and keep learning the rest while you start building things. Create a webpage that uses GitHub Repositories API to fetch and show the top 10 repositories of the current week in a nice responsive format. Create a simple todo list application that allows you to add tasks, mark them complete, edit them and delete them. Create a simple stop watch where user can start, stop, pause and reset. Add bootstrap to the above projects using npm or yarn. Create an npm package that takes a username and gives back the list of links found on the social networks (if they exist). 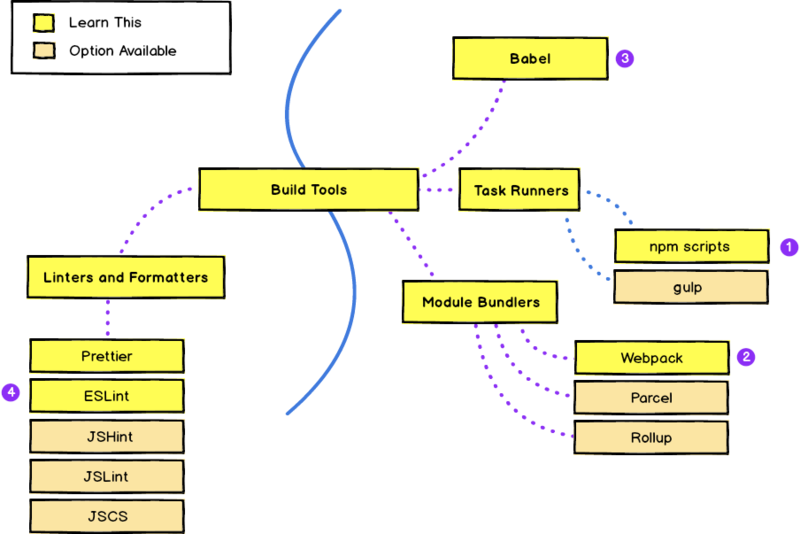 It should be usable in the browser, bundle it with webpack, use babel to transpile it and use ESLint for linting. Next step is learning about some frontend framework. 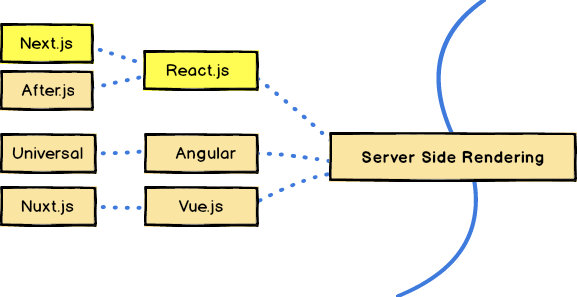 There are multiple options but the ones most commonly being used these days are React, Angular and Vue. I would recommend you to go with React. First of all learn React, then have a look at redux and after that learn about CSS in JS; which isn’t required but have a look at Styled Components and CSS modules if you would like. Once you have learnt react, go ahead and read about Progressive web apps. Now that you know frontend frameworks, it shouldn’t be that difficult for you. Have a look at the PWA checklist, read about service workers, measuring performance, using lighthouse and look at the different browser APIs that you can use to your advantage e.g. Storage, Location, Notifications, Device Orientation and Payments. Also read about RAIL model and PRPL pattern. Once you are done with this, you should be able to call yourself a modern frontend developer. Make sure to practice what you learn. Here is the list of tasks that you may pick from, if you are looking for ideas. Create a simple application that lets you pick a few hash tags and uses twitter’s search API to fetch and show you the most recent tweets for those hashtags in a trello like layout grid. Try to pin the hashtags so that when the user refreshes the page, it remembers the hashtags that you picked. Use react router and add about pages. Create a pomodoro application similar to this one that lets the users configure the duration for work and breaks, shows notifications and plays a sound whenever work or break has ended/started. Re-create the github trending page using React and allow filtering using language and dates just like github. You may add any libraries for dates. 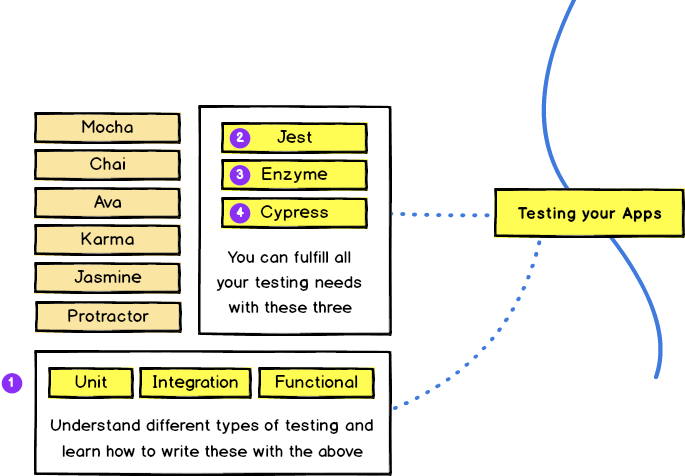 Learning to write automated tests for your applications is going to save you a lot of headache in future and is going to put you in a better position when looking for a job. Fir of all, go ahead and learn what are the different different types of testing, different concepts such as mocking, stubs etc. After that, go ahead and learn Jest, Enzyme and Cypress in the respective manner. Also learn to calculate the test coverage. For the tasks, go ahead and write unit, integration and functional tests for the application(s) that you created in Phase 4 above. Type checkers allow you to make your code more maintainable as it grows, increases your agility when doing refactoring, provide better support in the IDEs and are the best form of documentation that you can have. There are mainly Flow and TypeScript in this domain. However, there is more push towards TypeScript and I would recommend you to go with that. Server rendered applications allow achieving better performance and improved SEO as compared to the client rendered applications. Although not a requirement but it would definitely help you in crafting better frontend applications. There are different options available, based on the frontend framework of your choice; but if you picked React.js then you should go with Next.js which makes SSR a breeze. Everything shown in this phase is optional and is not really required for you but if you would like to try them out, go ahead and have a look. Please note that for the sake of brevity, I haven’t gone into the nitty gritty and have tried to give you a bigger picture; go and figure out while you learn. The complete chart for the whole roadmap is given below with some additional details written inside it. 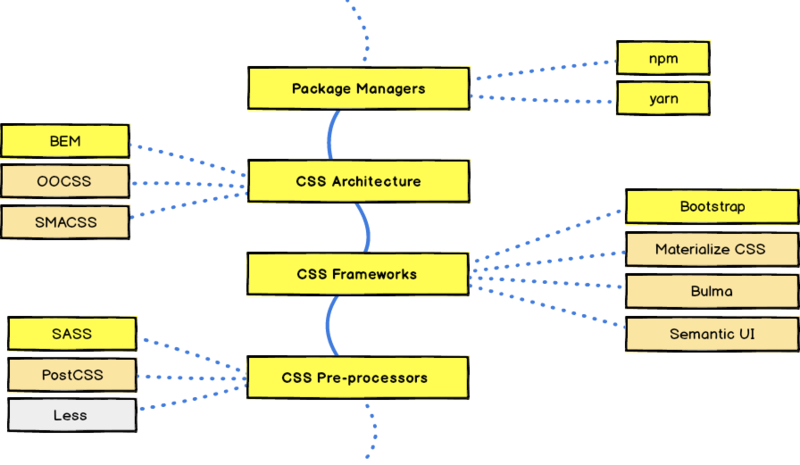 There could be things still missing in the roadmap but this is all of what you need for any “Frontend Engineering” role. And remember the key is to practicing as much as you can. It might look scarier in the beginning and you will feel like you are not grasping much but that is normal and over time you will feel that you are getting better and better. And don’t forget to ask for help if you are stuck, you will be amazed by how many people are willing to help. This roadmap along with the backend and operations roadmaps can be found through my GitHub profile. Please note that I am still working on upgrading the Backend and DevOps and plan to release them in the next few days. Having said that, this post comes to an end, feel free to befriend me on twitter or say hi by email. Until next time, stay tuned!